I am living in the white pepper era. It is my spice of choice. I add it to almost every dish, grinding it fresh in a mortar and pestle. It has an earthiness, a certain darkness that emphasizes umami notes in a dish and provides the perfect counter-balance to acids. I first started adding it to salad dressings, then moved on to giving a sprinkle to the soy sauce and vinegar that accompanied gyoza. When eating yakiniku (Japanese bbq), I added the white pepper to scallion, lemon and sesame oil. 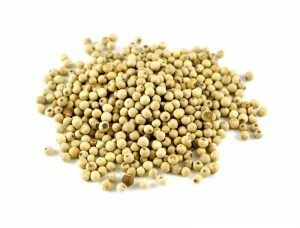 Before long, I found myself missing the flavor in pretty much anything I made — white pepper became essential to all the dishes in my lexicon. I find that it, even a small amount, elevates food, or maybe it just makes my food taste more like my food. I have had other eras. Back in the 90s, it was Cumin Time. I added the spice to black beans, to soups, to stews, even snuck a bit into hamburger to give a vaguely Middle Eastern note to the typically American flavor. I admit that I over-did it, I was heavy-handed. My sister observed that I actually started to smell of cumin — the nefarious “pencil” BO that I have previously posted about. I didn’t so much as add cumin to a dish, I used cumin like a lasso to tame the wildness of foods that I was still learning to cook. Smells have their eras as well. The 90s were dominated by CK One. You could not escape it. The smell was everywhere. Every magazine contained a sample and every man, woman and child was infected. If I catch a whiff of CK One now I am instantly transported to the dance-floor at Nell’s, my baggy Girbaux Jeans still looking fresh. The new century was devoted to Febreze, terrified users trying to wipe out the ugliness of a new millennium by attempting to dominate the aroma of the natural world. It may be a personal thing, but the smell of Dippity Doo or Ozium transports me, with attendant anxiety, to the early 80s and the miasma of adolescent insecurity about hair and escaping weed smoke. Given these associations, the White Pepper era seems to mark a maturity. An era of balancing concerns — acids to sweetness, umami to vegetal — rather than dominating with one-note bombast. We live in a swirl of metaphor, peaking at the tea leaves to decipher where the hell we are and where we have been. I am definitively what I eat, and given that, the future looks better than expected.